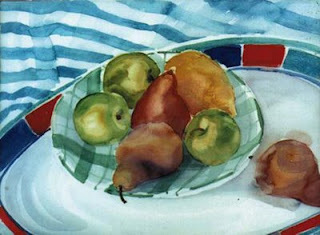 This quick study really shows how masa paper keeps the watercolor from spreading uncontrollably. The color spread is limited and the transtions between areas of different color is gradual. This the definition of a soft edge. 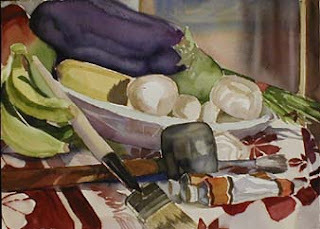 Also the layers of color are apparent in the background. That’s something that can not be done on wet rag paper. The self-portraits in the last posts and this one were all painted to acknowledge the studio. I wanted to declare my seriousness as an artist. It has been my experience that it is difficult for me, as a women, to convince whatever art authority that I am a serious professional. 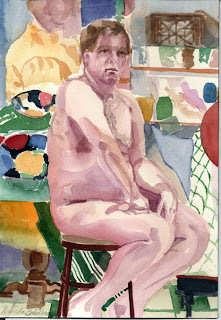 I have also acknowledged the mirror into which I looked to create this painting. You can see the bevel. This piece shows some of the beautiful granulating textures masa paper provides. Masa paper is an oriental paper used for printmaking, watercolor, or calligraphy. Each side has a different surface quality: one side fuzzy, one side smooth and shiny. It is thin and appears flimsy but it is very strong and difficult to tear. 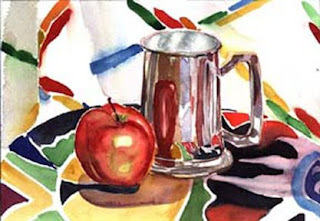 The fuzzy surface quality and limited absorbancy of the paper makes watercolor behave differently on wet masa than on wet rag paper. The fuzziness tends to trap the color and prevents it from diffusing uncontrollably across the wet surface. This characteristic gives you a control that is not available with wet rag paper. It also provides soft edges and atmospheric effects and allows the layering of one color over another on the wet surface without them flowing together into mud. You can see that at the transition between the background colors of this little painting and the granular texture that results. Can you tell I like it? I really, really like it! This woman is not the ordinary model people expect. She is large. I have posted some image of heavy women before but have never explained them. I really object to the media driven concept of beauty and obsession with youth. I also object to the premature sexualization of little girls. To be veiwed only as an appearance and to be judged based upon sterotypically narrow standards that are always changing (fashion), is harmful not only to those who do not conform but to those who briefly conform. Those who do not conform are under a constant barrage criticism and ridicule. Those who do conform will grow older or their “type” will go out of fashion. This was done in my studio. This man is not a professional model. I think it can be seen in his pose. He is a little tense and the pose is a little defensive. He is a perfectly nice man but a little uncomfortable with modeling. He does, however, like being part of the artistic process. I did this piece as an observation on our attitudes towards nature. We go out to the countryside and think, “Ah, nature!” but in actuality what we experience has been vastly altered by artificial selection over the last 8,000 years. The tulips in our gardens originated in Persia and most of the rest of blooming plants we enjoy are from a single region of China. 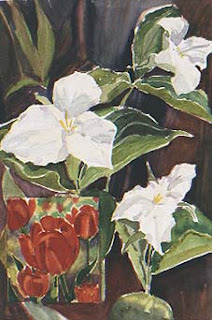 Just as a reminder that we have meddled with nature a great deal for good and ill, I depicted an indigenous blooming plant, the trillium, with a highly domesticated, imported plant. I also wanted the viewer to have to discover that I had two images by keeping the boundaries between the images less distinct. This had to be done quickly as the eggplant, mushrooms and bananas were the real thing and it was was a hot summer day. I bought them from an Asian market that was around the corner from my studio. I also thought to place some of my artist’s tools to acknowledge my occupation and the location.